With an immigration reform showdown between Republicans and Democrats looming large over the nation, the important swing state of Florida could be ground zero for the fight to reform the controversial and broken national immigration policy. Congress is expected to pass a pro-DACA bill that will allow those 800,000 illegal immigrant children permanently stay in the US, but could blanket comprehensive immigration reform be just around the corner? Democrats would like to see nothing less than full amnesty for all illegal immigrants currently living in the US, and could use the DACA bill as leverage to force a full debate on immigration reform. In Florida, Republican gubernatorial candidates are trying to out-hawk one another when it comes to legal immigration. The candidates-Rep.Ron DeSantis, AG Commissioner Adam Putnam (pictured), and House Speaker Richard Corcoran (has not announced yet)- are all jockeying to be considered the states most conservative and pro-legal immigration candidate. Corcoran, who like we said has not yet announced his candidacy, has been pushing a very aggressive anti-sanctuary city narrative. Here is the letter minus many of the signers (too many to list). 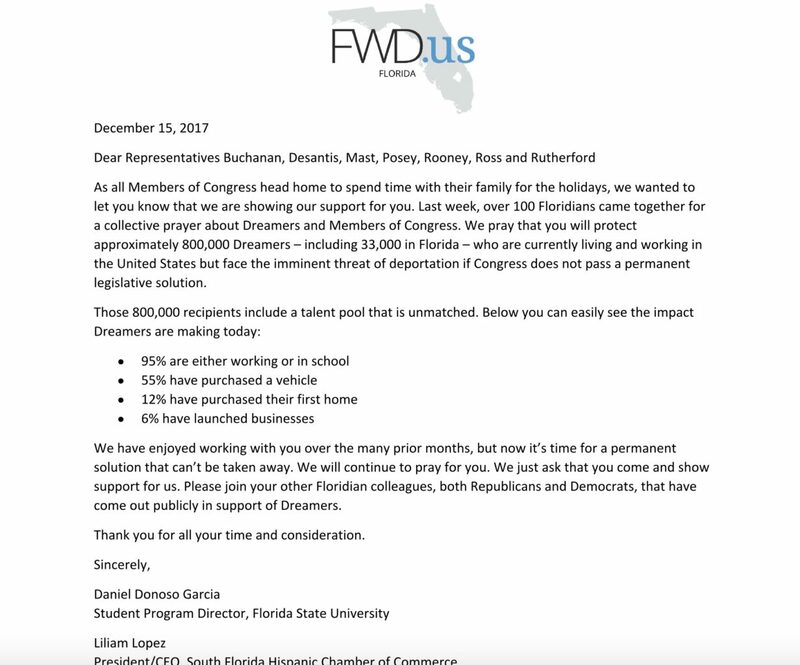 The letter does not specifically state that DeSantis favors amnesty for DACA kid, but could leave some questioning what kind of work he has done to help these groups in their efforts to push their immigration agenda. DeSantis recently told Fox News that congressional Republicans should steer clear from addressing the DACA issue, saying that it would be “a mistake” to do so. While he vehemently opposes Sanctuary cities, Putnam’s position on immigration reform is a mixed bag of sorts. While in the US Congress, then-Congressman Putnam voted for bills that were perceived as being pro-illegal immigration, and most recently supported Senator Rubio’s 2013 ‘Gang of Eight” Senate immigration reform bill. Gillum is in a hotly contested primary race with former Congresswoman Gwen Graham and Miami Beach Mayor Phillip Levine. Could Nikki Fried play spoiler in Florida’s Cabinet?